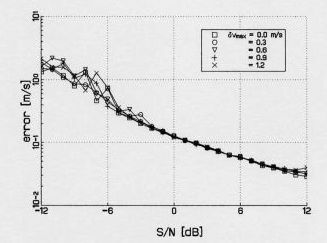 To estimate the sound and flow velocities of fluid in pipes the transit times of ultrasonic pulses travelling upstream and downstream are used. These transit times are classically measured by using zero crossings in the received signals. whereby is the factor of merit with and the mean frequency and bandwidth. Fig. 1 shows the alarm and detection probabilities as functions of this parameter. The noise is assumed to be Gaussian and the signal a band filtered Dirac function. It is clear that the zero crossing technique does not work with low S/N ‘s. By using instead of zero crossings a number of data of the phase signals, the latter obtained from the real signals, in a nonlinear least-square method, the accuracy and robustness of estimation of the flow are increased an order, see Roosnek , . Fig. 1. 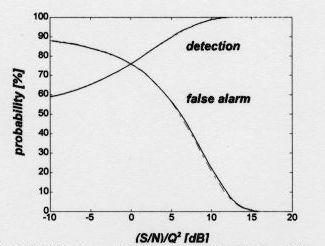 The false alarm and detection characteristics for filtered Dirac pulses as function of Q and S/N for the detection of zero crossing; see text. With a model for the flow and the history with errors, optimal estimation leads to the well known Kalman algorithm. In this way the flow pattern can be described, besides parameters for the transducers and sound velocity, by a number of suitable flow parameters describing the flow pattern. Such a direct estimation from the phase signals is more elegant and increases the accuracy and robustness even more. whereby t, , c and are respectively the time relative to the arrival time of the pulse, the resonance frequency of the n-th transducer, the sound velocity and the vector describing the flow pattern. leading to the removal of the 2 ambiguity. making it suitable for digital signal processing. with the weight of the k-th phase point of the signal received by the n-th transducer. This method is known as the nonlinear least square method (LSQ). Fig. 2 shows the results of the simulation of a two-channel flow meter for a pipe diameter of 16 cm, a mean signal frequency of 100 kHz with a crude model in the estimation and air as the gas, see Roosnek . Fig. 2. Flow error as function of S/N and rapid flow fluctuations for nonlinear least square estimation. 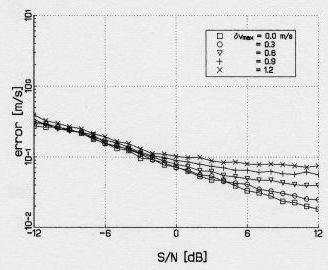 With modelling of the flow, determination of the S/N from the measured signals and the errors of the previous parameters and applying optimal or Kalman estimation the resulting algorithm is very robust, accurate and without any out of lock condition for the S/N range 12 to -12 dB. Fig. 3 shows the results of the simulation. Fig. 3. Flow error as function of S/N and rapid fluctuations for Kalman estimation. However the LSQ method (Fig. 2) shows at higher S/N and larger velocity jumps to be more favourable than the optimal estimation (Fig. 3). The calculation used for Fig. 2 is based on estimating the average flow and sound velocities after estimating the transit times of the arrival of the pulses at all transducers with the average simulation velocity. In case of the Kalman estimation (Fig. 3), the flow velocity is determined immediately after obtaining any acoustic signal, showing more the difference in the estimated and the simulated flow with its jumps, being apparently less optimal. These figures show clearly that estimation and robustness can be increased more then an order by using many more points of the measured signal in a proper way, using a model for the flow and applying optimal estimation. These optimal estimation techniques are also used in different fields, for instance in aircraft noise tracking and monitoring and offshore pipeline detection and tracking.